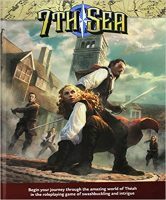 7th Sea is a tabletop roleplaying game of swashbuckling and intrigue, exploration and adventure, taking place on the continent of Théah, a land of magic and mystery inspired by our own Europe. Players take on the roles of heroes thrown into global conspiracies and sinister plots, exploring ancient ruins of a race long vanished and protecting the rightful kings and queens of Théah from murderous villains. It is a world of sharp blades and sharp wits, where a cutting retort can be just as deadly as a sword’s point. Since its release in 1999, 7th Sea has brought thousands of fans into the world of Théah—a place similar to our own Europe in the year 1668. John Wick Presents is proud to bring 7th Sea back to your gaming table. John Wick brings 7th Sea back in a 300-page, full-color, hardbound book. Revised rules, revised Nations, updated for the 21st Century. Add a Review for "7th Sea RPG (2nd edition)"